I absolutely love my night-time dreams. Often they feel like my very own “mini-series”, however despite them being enjoyable to experience and interesting to witness, I don’t pay nearly enough attention to the wealth of valuable information they contain or in the symbols they offer as I feel quite unskilled at interpreting them. Occasionally, one of those “profound” dreams which stand out and make you pay attention appears with vivid and graphic detail. A ‘BIG’ dream which won’t be forgotten and even if you don’t understand it, intuitively, you know that it’s important. This statement really stood out for me, and equally it can be applied to paying attention to the feminine and the non-linear ways that she works. Sitting on my nightstand is a beautiful book that Shakti gifted me to record my dreams in – to “pay attention” to them. Often I wait for a “profound” dream or the ones that seem to make sense to me before I write them down, but what I am learning is that the gift is actually paying attention to all of it – the insignificant, the confusing and the downright bizarre. It is a precious space where your conscious waking ego with its (rigid) personality structure is no longer in absolute control. When you start to pay attention to your dreams…..the unconscious starts revealing itself to you. Your dreams will build a bridge between the psyche and the physical/material world. If you pay attention, your dreams will reveal aspects of your shadow to you – you can do really creative and important work whilst you are sleeping. The more consciousness you bring to your sleep states, the more mindful you will be in the waking state – and vice versa; each informs the other. The more of the dream that you bring into your waking reality, the more the line between the conscious & the unconscious blurs and the potential for the opposites to unite increases. The gift of paying as much attention to your dreams and giving them equal weight to the events that happen to you in the external world is that duality dissolves and you dip into the experience of transcending duality. 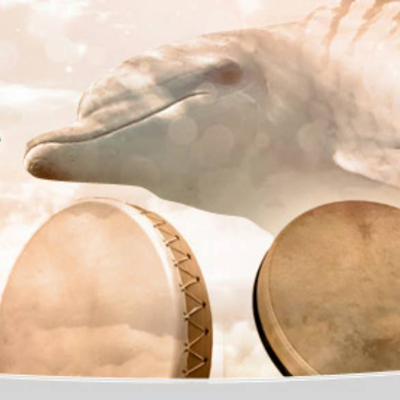 Honouring Shakti and remembering how she listened to and followed the wisdom of the “dreamtime”, we are traveling to Mozambique later this month (20-30 Oct) to journey with the dolphins and “Dream our Souls Vision” into being with Lance, a highly skilled shamanic visioning facilitator and Courtney Ward of Halo Gaia – part human, part mermaid, part dolphin ocean safari facilitator extraordinaire! In preparation for this event Lance has invited us all to start paying attention to our dreams. Those directly related to our time together and even those that are seemingly unrelated. They may come to us during sleep or when we are awake and fantasizing or imagining what it will be like in Mozambique. They could include the things we look forward to and are excited about and the things we are a bit nervous about too. This is a time where we can also pay attention to the thoughts and intuitions we have during the day or our hopes, questions and visions for the future and the future of our blue green planet. One of the themes we will be exploring is: What is it that is wanting to emerge right now? What is the new story that I want to pass on to the next generation? What is trying to emerge in my own life? What is wanting to emerge in my community, in my country and in the world and how can I best support and serve this? If you would like to be part of this gathering of soul visionaries, come and take a deep dive with us into the warm waters of Mozambique, accommodated in a luxury tented camp for 10 nights of deep visioning through meditation, ceremony, inquiry, subtle movement and questing through guided drum journeys, breath work and dance supported by direct encounters with our sentient friends in the deep blue; then please email Rhianne van der Linde or look here for more information.